Antares, also known by its Bayer designation Alpha Scorpii (abbreviated to α Scorpii or α Sco), is the seventeenth brightest star in the nighttime sky and the brightest star in the constellation Scorpius. It is often referred to as "the heart of the scorpion". Along with Aldebaran, Regulus, and Fomalhaut, Antares comprises the group known as the 'Royal stars of Persia'. It is one of the four brightest stars near the ecliptic .Distinctly reddish when viewed with the unaided eye, Antares is a red supergiant of spectral type M2Iab and is one of the largest and most luminous observable stars. It is a slow irregular variable star with an average magnitude of +1.09. 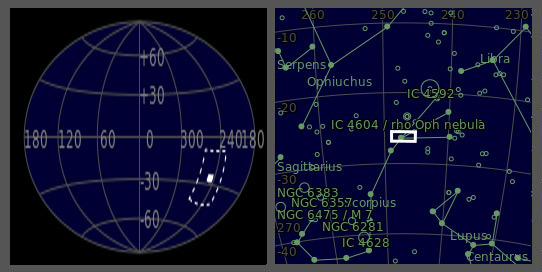 Antares is the brightest, most massive, and most evolved stellar member of the nearest OB association (the Scorpius-Centaurus Association). Antares is a member of the Upper Scorpius subgroup of the Scorpius-Centaurus Association, which contains thousands of stars with mean age 11 million years at a distance of approximately 145 parsecs (470 light years). This is a 8 panel mosaic and the image above is resized version of the full mosaic (11800 x 4500pixels). Below is a zoomable image. Zoom in and out with the mouse scroll button, holding Alt button (or using the slider below); click and drag with the left mouse button to pan.